In order to launch Benetl, you have to use "etltool_gui.bat" from "C:\Benetl". You can learn more about "etltool_gui.bat" at: 9. EtlTool running and 11. Files of an EtlTool. Then you have to choose a folder and a datasource file (.txt or .csv extensions). Since Benetl 1.8 .xls file format is supported. Important: Benetl reads first sheet of .xls files and creates .txt files, in order to parse them. The separators for fields must be ’;’ or tab. 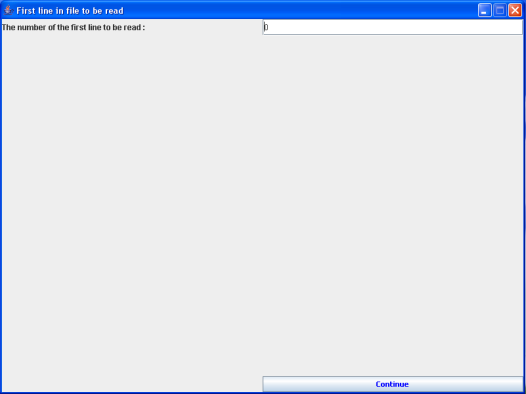 In this screen you enter the line number from which you want to start reading a file. The first line is: 0.